With the holidays right on top of us, it’s a great time to get some additional savings on some of the most popular Hunter Douglas products around. At Bretz Interiors serving the greater Denver area, we’re proud to carry the entire Hunter Douglas line, including the products that are eligible for savings. If you’ve been shopping for window treatments already, the odds are good that a product you’ve had your eye on is on the list. For details, speak with one of our representatives today. Duette® Honeycomb Shades. Energy-efficient, beautiful, and functional, Duette honeycomb shades trap air in their honeycomb pockets to help keep rooms cool in the summer and warm in the winter. Sonnette™ Cellular Roller Shades. Sonnette gently diffuses light through an innovative, curved shape. Available in 48 colors and in semi-opaque and room-darkening opacities, Sonnette Cellular Roller Shades will enhance any space. It’s no wonder it was the winner of the 2017 WCMA Product of the Year Award! Now through December 10, 2018, if you purchase the required minimum of an eligible product, you can earn a $100 rebate. Plus, if you purchase additional units, you’ll earn even more. 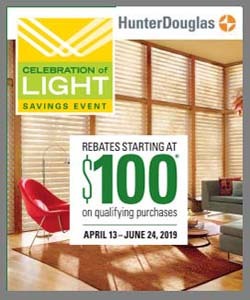 Just fill out the rewards claim, mail it to Hunter Douglas, and you’ll receive your rewards card in the mail. Additional restrictions could apply, so speak with a representative for full details.